Join us at SMX Munich on Monday 13th March to really take your global campaigns to the next level and grow your business around the world! Success in international digital marketing is not just about translating your website and localising your content. It’s not just about technical expertise in geo-targeting or automation. It’s not simply reliant on processes across global teams. It’s a combination of all of these factors, and more. Global search success comes from combining local, cultural knowledge and expertise with technical skills and robust efficient processes, whatever your business size or sector. The International Search Summit takes these pieces of the jigsaw and puts them together. 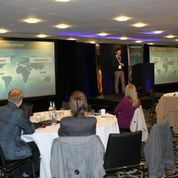 A range of expert speakers with diverse experience will share insights, tips and tactics across the key components of success global campaigns and leave you with a clear vision of how to take your international efforts to the next level. The sessions at ISS will assume some level of knowledge of search practices and techniques, and they will focus on the specific challenges, considerations and tactics that impact international online campaigns. Russia is Europe's largest internet market, and its homegrown search engine Yandex is the market leader, making it an essential channel for any organisation wishing to reach a Russian audience. This session will cover key topics about the Russia market, as well as how international businesses can optimise both organic and paid campaigns in Yandex to reach a wide and relevant audience. How do you manage country campaigns, when there are multiple languages at play in that market? What benchmarks should you check? What about scaling efforts across more search engines than just Google? Same language, different keywords and themes? Maybe not. How do you bootstrap keywords and ad creation when you don’t have in-house translation services? Mihai Popescu will share examples and insights from his experience working for two leading global travel websites and provide tips for improving efficiency and performance. From testing a new market or product to expanding at scale, paid search remains a vital channel for international digital marketers. It is quick to implement and see results, and can help with everything from branding to conversions. 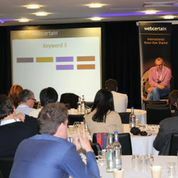 Robin Heintze will share his top tips for how to effectively use paid search campaigns when expanding internationally and/or growing existing markets. He’ll share examples from real-life campaigns and actionable advice for getting the most out of your efforts. For many businesses, targeting China is high on the priority list. However, such a unique market requires a unique strategy and a good understanding of the culture and audience. Growing increasingly in importance in China is Wechat and it’s a platform that any business wishing to truly reach a Chinese audience needs to utilise. Christina will share insights and tips for getting the most out of any Wechat activity. This topic is at the heart of international SEO, as geo-targeting has a huge impact on the success and performance of global websites. Google’s John Muller will dive into the different geo-targeting options available and provide guidance on how to select the best option for your website, as well as how to ensure correct implementation. Site speed is an important factor for search engines and users alike: a slow site most likely means slow sales and low rankings. Bastian Grimm will share his top strategies for ensuring your site loads as fast as possible, wherever in the world it’s been accessed. He’ll dig into mobile optimisation, CDNs, AMP, as well as sharing insights into which tools can help when optimising site speed on an international scale. One of the biggest challenges in international SEO is getting the technical implementation correct, ensuring that both users and search engines will have a seamless experience on your site and find the information they seek. Jesse James Woods will share his 25 top tips and tactics for getting your international SEO right, including hreflang and canonical tags, internal linking across domains, effectively utilising search console and useful tools for monitoring organic performance in different global markets. In this final session of the day, Andy will take an overall look at culture and strategy in international campaigns. He’ll share cultural pitfalls to avoid, cover product and pricing considerations and address the factors to consider when planning an overall strategy. He’ll also look at how to effectively manage international team or agency relationships and develop effective, accurate reporting for global campaigns. Andy Atkins-Krüger is the CEO of WebCertain Group, an international web marketing agency which brings together native speakers from countries around the world to provide a centralized hub for clients. It is one of the only agencies to focus solely on international projects and covers over 44 languages in-house. Andy contributes regularly to publications and blogs on international search. 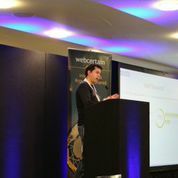 He writes regular of blog.webcertain.com. He also speaks regularly at conferences around the world including SMX, SES, Eye for Travel, Click Asia Summit and PubCon. In addition,Andy is the Chair of the International Search Summit. Bastian Grimm is the Director of Organic Search at Peak Ace and a renowned expert in large-scale, international SEO – managing sites of almost any size in highly competitive industries. Always eager to expand his knowledge, with more than 15 years’ experience in online marketing, technical and global SEO, Bastian currently oversees Peak Ace’s search engine optimisation as well as content marketing initiatives. Striving for efficiency is one of Bastian Grimm’s key guiding principles. It has shaped his entire career. His belief that understanding a target market means not only getting to grips with the language, but also the culture, has held him in good stead. Bastian leads a thriving team of expert native speakers, able to serve clients in 20+ languages, and the results speak for themselves. A full-service performance marketing agency with a focus on “all things search,” Peak Ace has a flair for over-achieving. Having been named a FOCUS growth champion for multiple years in a row, as well as scooping up trophies at both the European Search and Drum Search Awards, Bastian is proud to lead such an innovative, ever-expanding company. His secret? Dynamic, decisive processes, a phenomenal team and going to bed with inbox zero. Gemma Houghton has been working in international search for 5 years and leads WebCertain's marketing team. She is responsible for managing WebCertain's online marketing activities around the world as well as organising and programming the International Search Summit, which runs across Europe and the US. She contributes regularly to the multilingual-search.com blog and writes for State of Search. She has spoken on international search on various webinars and at conferences. Gemma holds a Professional Diploma in Marketing from the Chartered Institute of Marketing and a BA Joint Honours Degree in French and German.